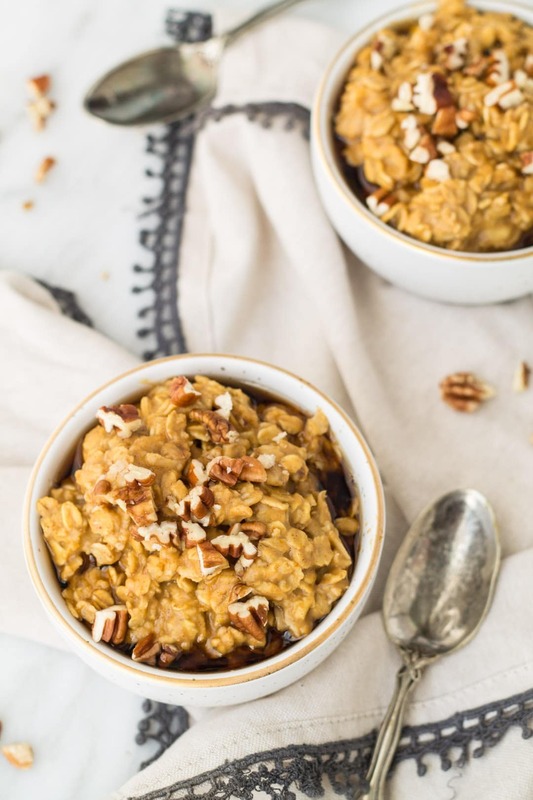 Filled with whole grain oats and nutrient-packed pumpkin, this Low FODMAP Pumpkin Pie Oatmeal is a fantastic fall-inspired breakfast. Whether we like it or not, fall is here … at least in the US. So, I say let’s embrace it and eat all things pumpkin pie! 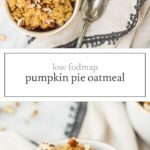 🙂 Enjoy this fall-flavored Low FODMAP Pumpkin Pie Oatmeal for a filling and flavorful breakfast or brunch! Oats are one of those foods that if we aren’t careful could trigger symptoms in some of us. Oats can be processed in different ways (rolled, steel-cut*, quick, etc.) and have varying levels of FODMAPs. Oat groats (whole oat kernels that are hulled): A low FODMAP serving is ¼ cup or 60 grams. *Steel cut oats to my knowledge have not been tested, as they are sliced oat groats, they should be tolerated in servings close to oat groats. If you’re a fan of steel-cut oats, it might be a food to test-to-tolerance after the initial elimination/reintroduction phase. If you have the Monash FODMAP app, you may notice that there are additional entries for oats in different countries with different “okay” serving sizes. Why? Different varieties of the same food can have varying levels of FODMAPs. 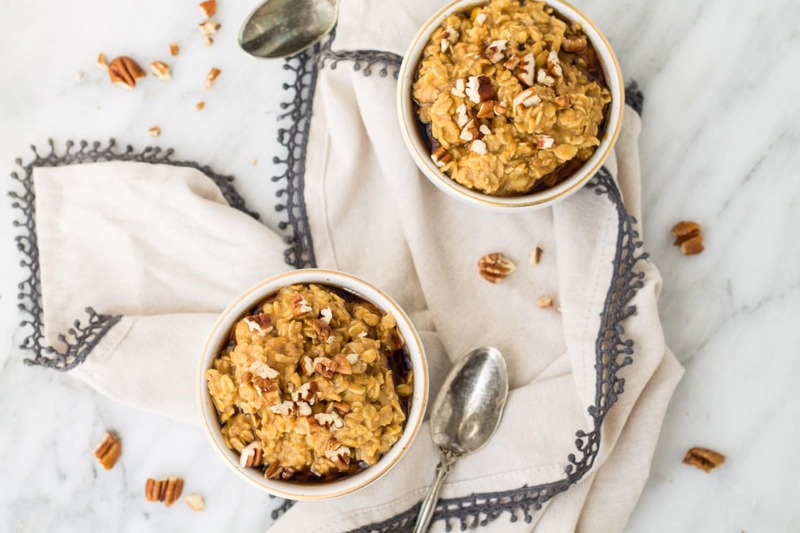 Therefore, the oats that we grow and enjoy in the US are likely of a different botanical variety than the oats grown and enjoyed in Europe or South Africa. 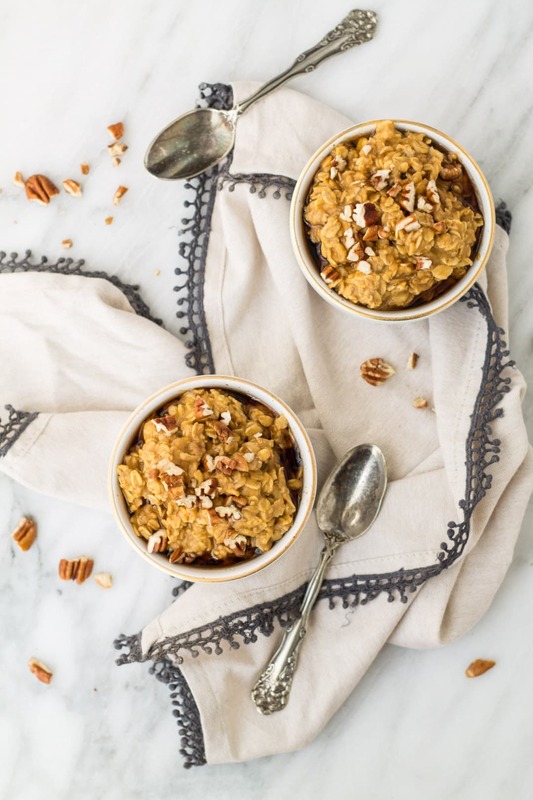 Low FODMAP serving sizes may change as more foods from different countries are tested, but for now, I am sticking to the more conservative, generic entry for rolled oats in my recipes. Combine oats and milk in a saucepan over medium-high heat. Bring to a boil, then reduce heat and simmer, stirring occasionally until desired thickness is achieved. Stir in pumpkin, vanilla, pumpkin pie spice, and maple syrup. Heat until warm throughout. Serve warm with pecans. Low FODMAP Milk: I like Milkadamia macadamia milk. Pumpkin Puree: A low FODMAP serving is ⅓ cup or 75 grams.